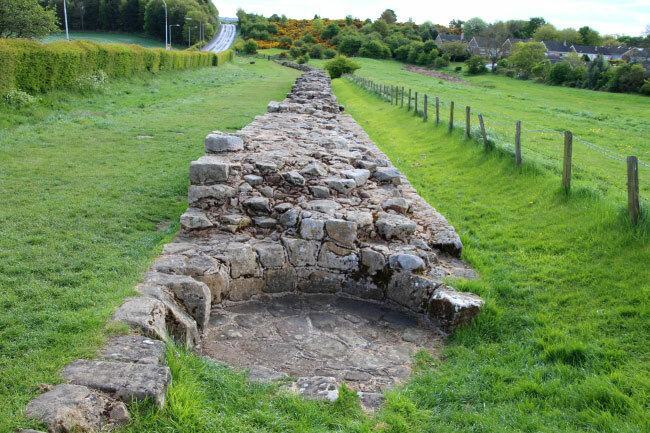 The Roman defences along the border with Scotland started in c.AD80 with the building of Stanegate Road from Carlisle to Corbridge. 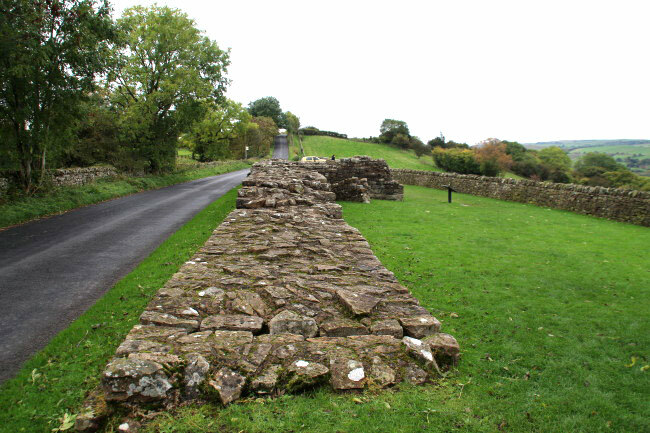 Along this road seven wooden forts were built including Carlisle, Vindolanda and Corbridge Forts. 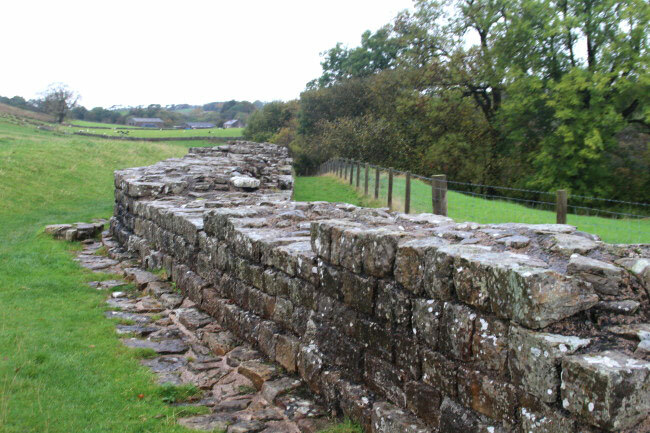 These were not as effective as had been expected so from AD122 a wall was built from Bowness in the west to Wallsend in the east on the orders of the Emperor Hadrian. 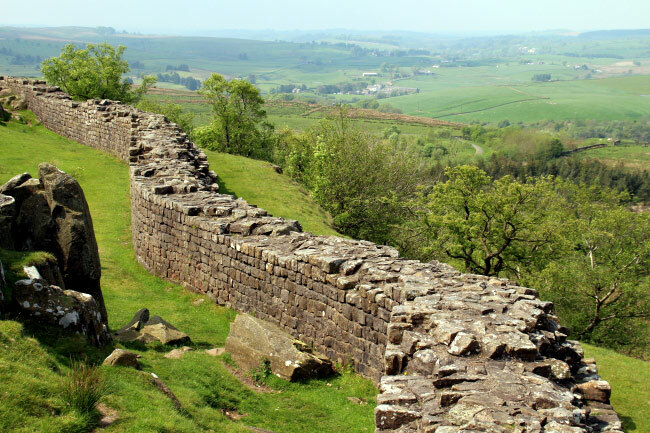 The wall was 80 Roman miles in length (73 miles) and followed a strict pattern of a 60 feet square milecastle or small fort every mile and two 20 feet square turrets or gateways in between each milecastle. 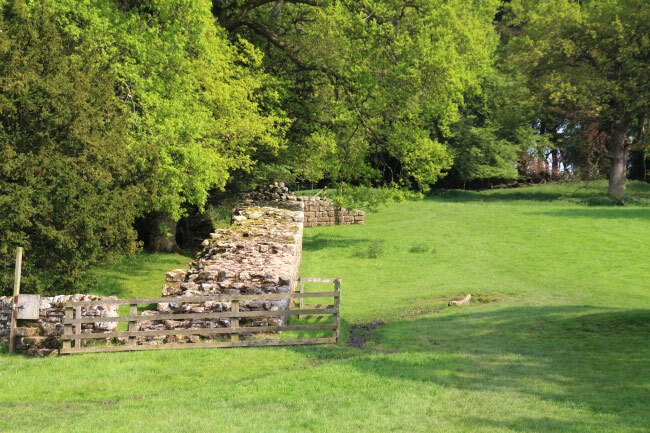 From Bowness to Birdoswald the wall was made of turf, 20 feet thick and 15 feet high with wooden forts but with the turrets made of stone. 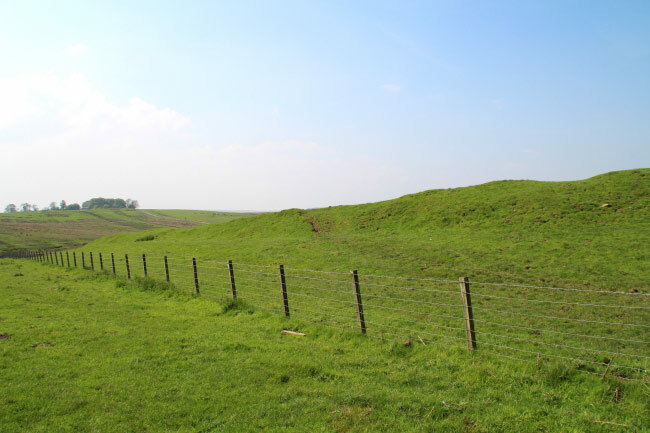 The eastern half was constructed of stone, 8 to 10 feet thick with a deep V-shaped ditch at the front and a second, flat bottomed ditch or vallum with a rampart each side at the rear. 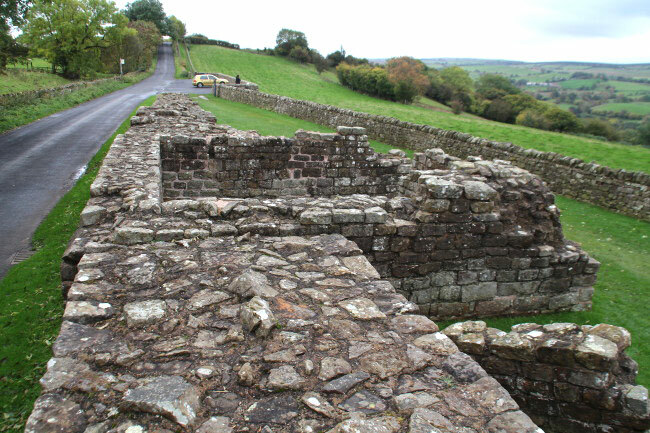 The milecastles and turrets continued for a further 40 miles down the Cumbrian coast, but without a wall. 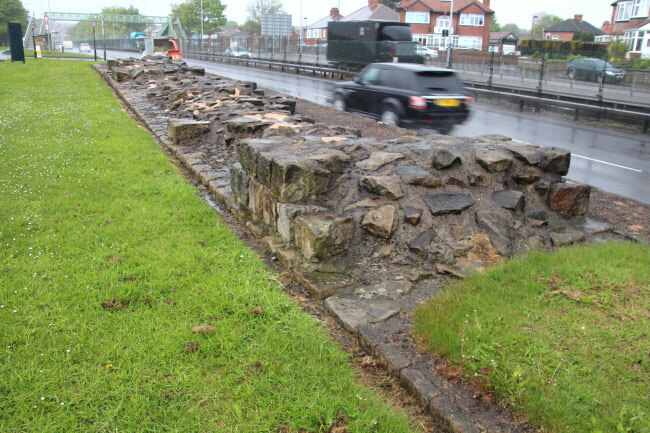 It took until AD160 to complete this massive construction work including rebuilding the turf wall in stone. 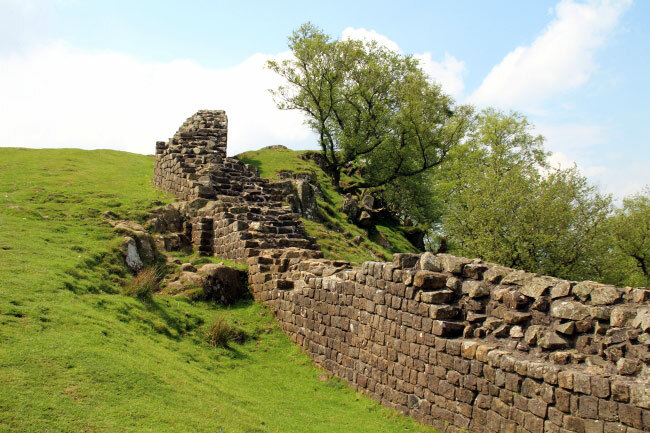 Initially it was manned from the Stanegate Road Forts, but these were not sufficently close so 17 new stone forts were built into the wall between AD128 and 138. 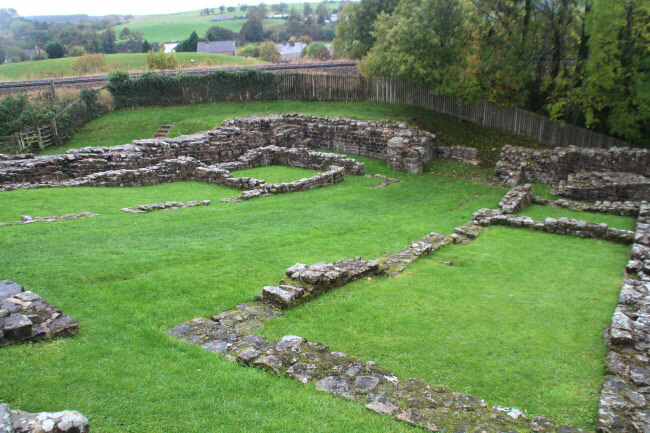 Two of the older forts, Corbridge and Vindolanda were rebuilt in stone as additional support. 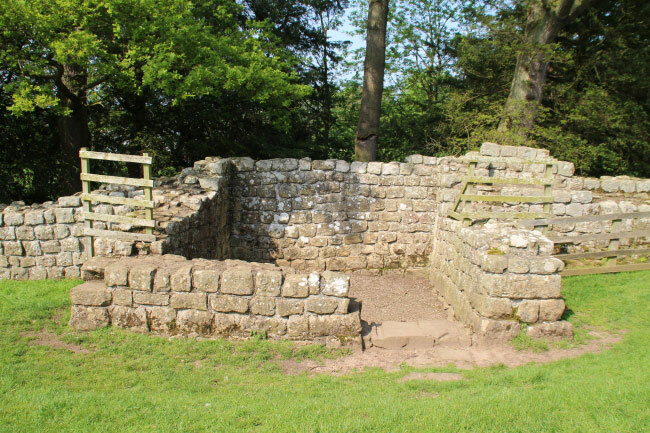 The foundations of some of these forts have been excavated and can be visited, the most interesting sites being Vindolanda, Housesteads, Chesters and Corbridge. 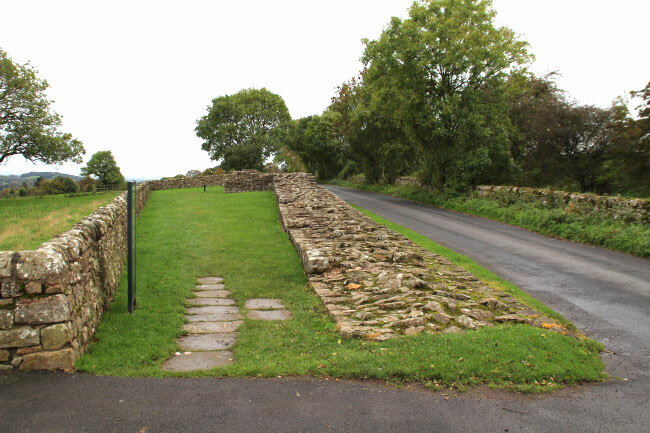 Sections of the stone walls still stand, particularly near Housesteads, although most of the stone has been removed for local houses and churches. 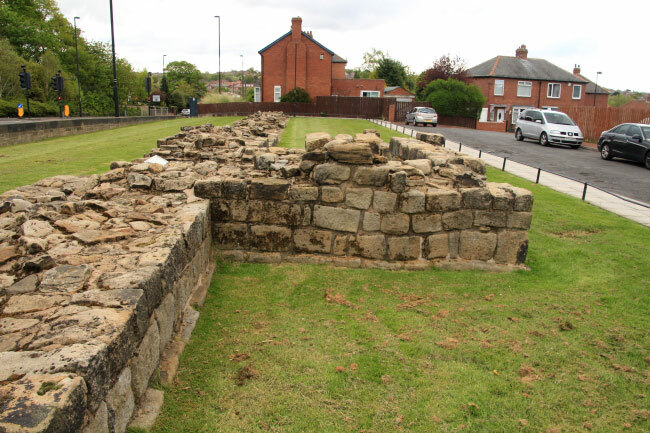 Segedunum lay at Wallsend on the eastern end of Hadrian's Wall near the banks of the River Tyne. It was in use from around AD122 to AD400 and measured 453 feet by 394 feet, covering about 4 acres. 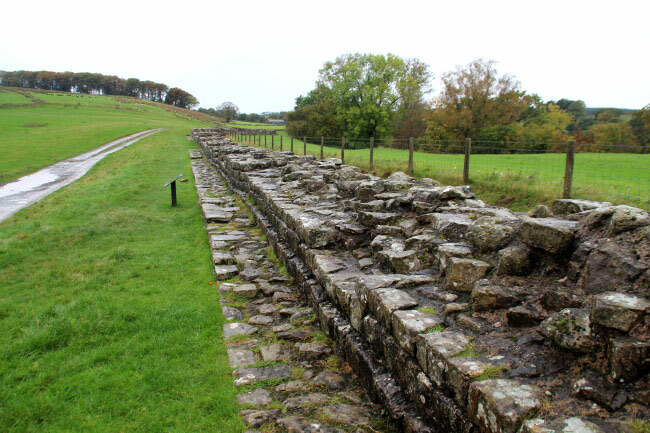 It is the most thoroughly excavated fort along Hadrian's Wall, and is operated as Segedunum Roman Fort, Baths and Museum. 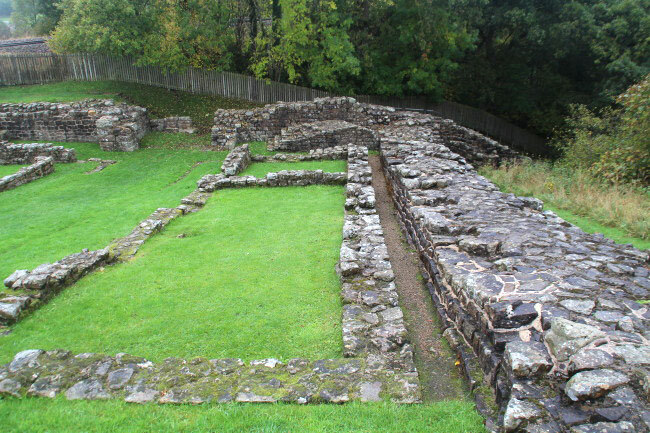 Pons Aelius was an auxiliary fort and Roman settlement at the original eastern end of Hadrian's Wall, at the site now occupied by Newcastle Castle, before the wall was extended to Segedunum. The fort which was situated on the north bank of the River Tyne was abandoned in AD400, and the site was later built over. 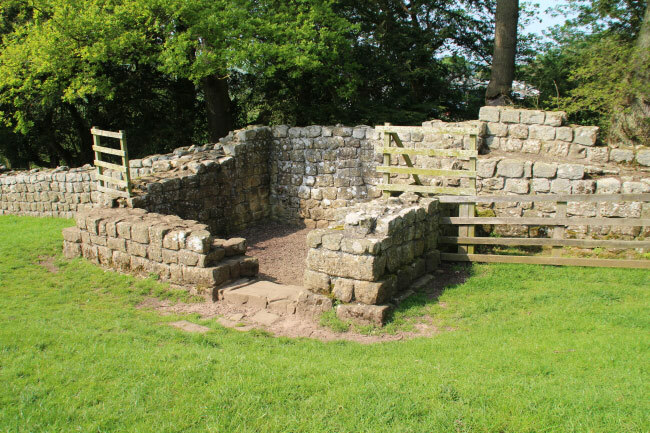 Condercum was the third fort on Hadrian's Wall, on the site of the Condercum Estate in Benwell. 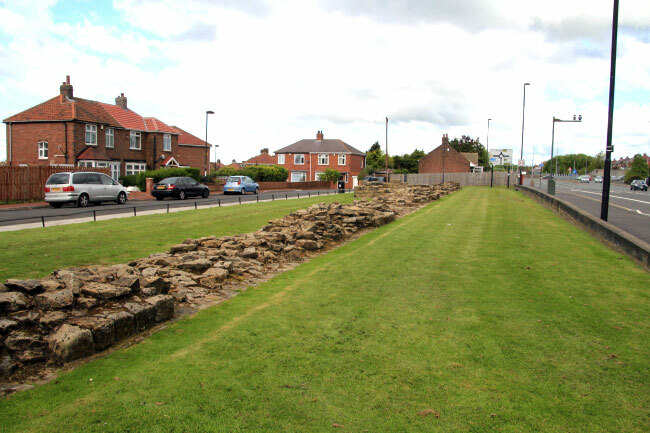 .....view Benwell Roman Fort photographs. 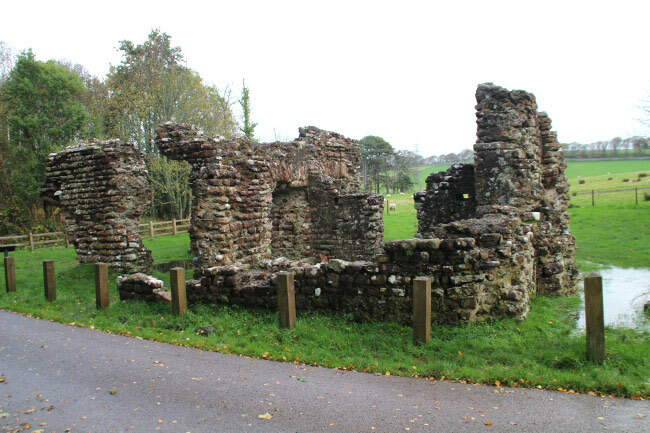 Vindobala was the fourth fort, situated about 7 miles to the west of Condercum. There is little to be seen on the surface apart from a few earthworks as the stone was removed from the site for local agricultural buildings. The fort is oblong, measuring 515 feet north to south by 384 feet east to west, and covers about 4.5 acres. 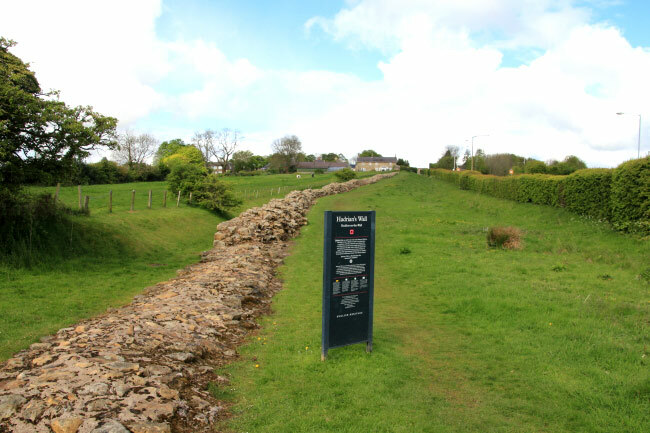 Onnum, also known as Hunnum, was the fifth fort, to the north of Halton where it guards Dere Street as it crosses the Roman Wall. The original fort was an oblong, measuring 460 feet north to south by 410 feet east to west and covered 4.3 acres, but at a later date the section south of the Wall was extended. It is believed that the fort was built between 122 AD and 126 AD. Only the fort's earthworks are now visible. 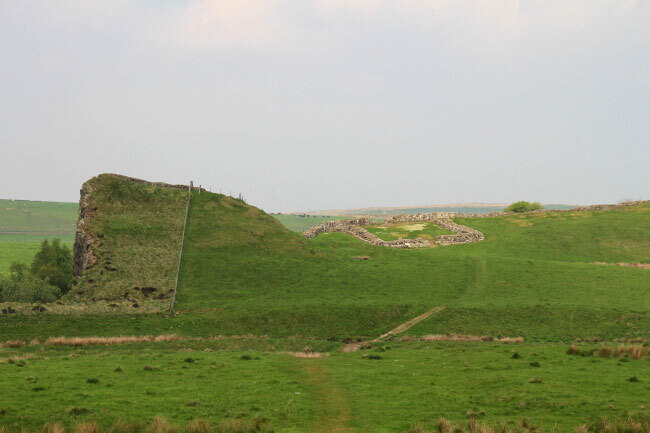 Brocolitia or Procolita was a 3.5 acre auxiliary fort a mile west of Milecastle 30 at Carrawburgh. Only the fort's earthworks are now visible, the Wall at this point and the fort's north ramparts having been demolished for the construction of the B6318. 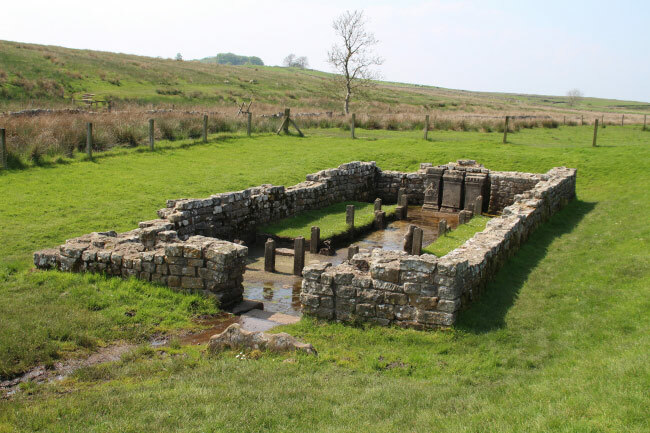 Humshaugh, Hexham, Northumberland NE46 4DB. 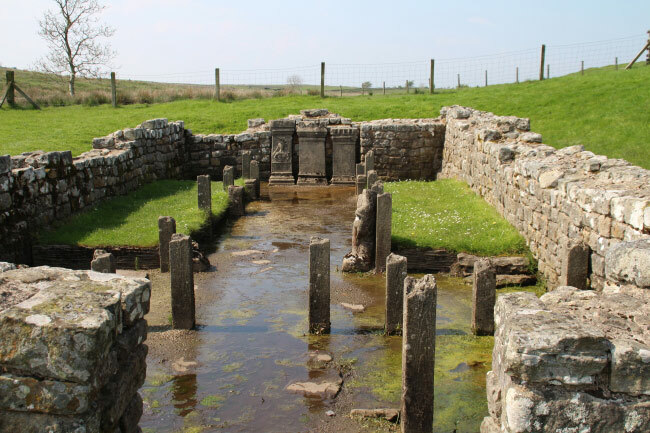 To the south of Carrawburgh Fort is a temple to the god Mithras. The temple was probably built by soldiers based at the fort in about AD 200. 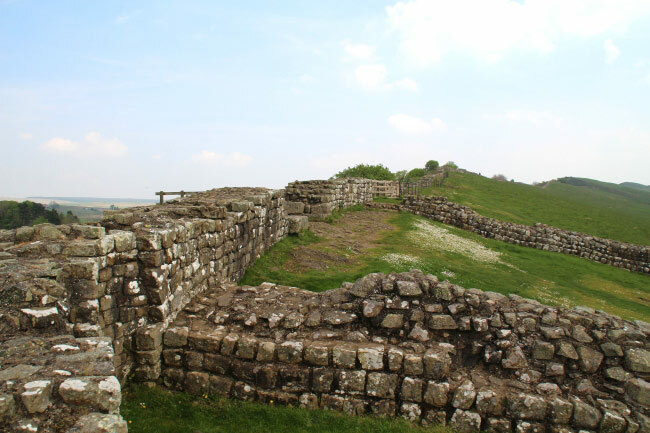 Vercovicium was an auxiliary fort on Hadrian's Wall at Housesteads siuated between Milecastles 36 and 37. The fort was built in stone around AD124, soon after the construction of the wall began in AD122. It measured 570 feet by 330 feet, covering about 4.25 acres. 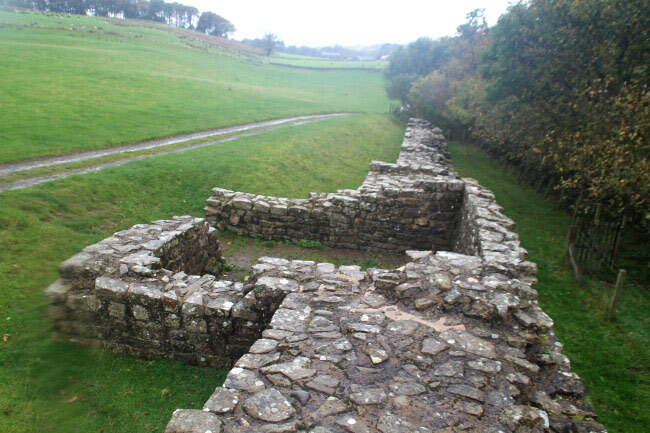 .....view Housesteads Roman Fort photographs. 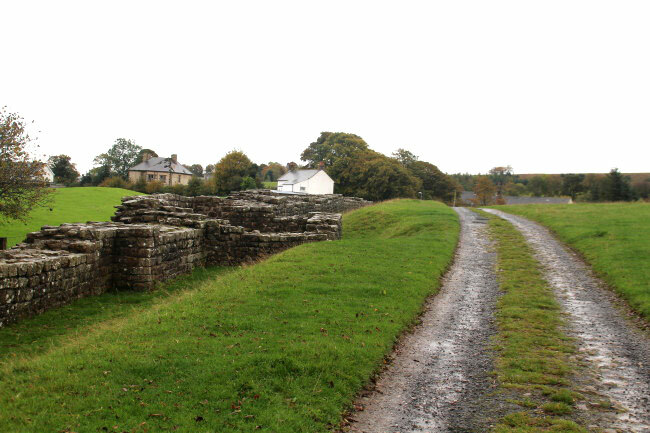 Aesica is one and a half miles north of Haltwhistle. 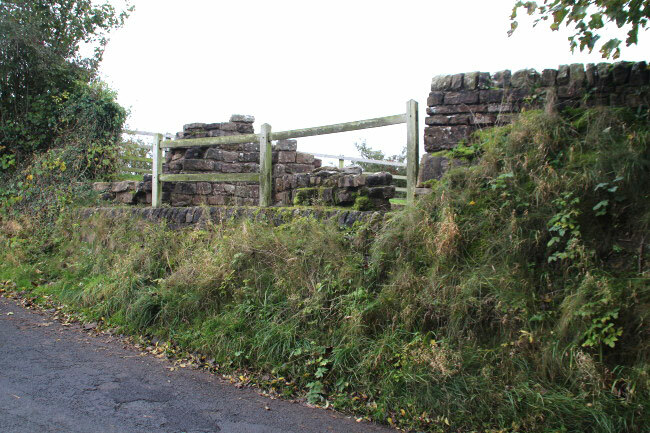 It was built in 128 AD to guard the Caw Gap, where the Haltwhistle Burn crosses the Wall. The B6318 Military Road passes about half a mile to the south of the fort. It was oblong, measuring 355 feet north to south by 419 feet east to west, occupying 3 acres. 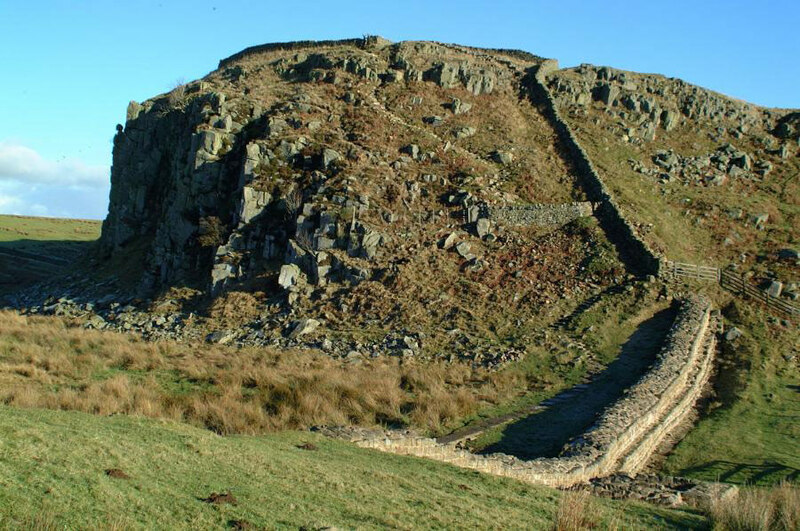 It replaced Milecastle 43 which was demolished once the fort had been completed. 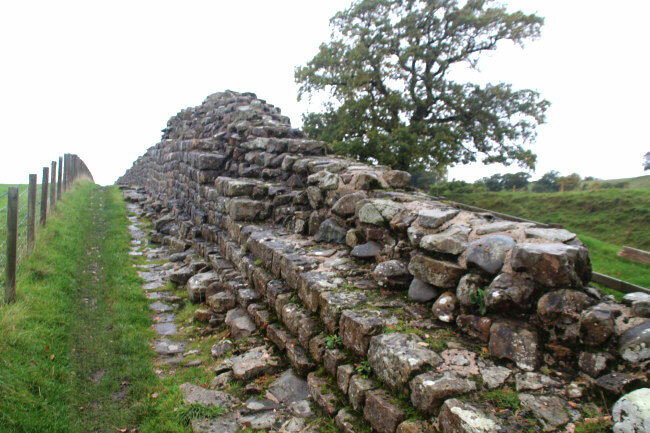 Magnis is near Carvoran and is thought to have been built before Hadrian's Wall. 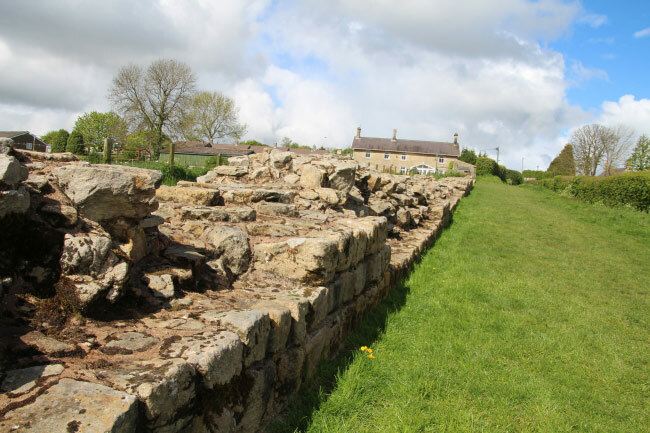 Near the fort is the Roman Army Museum owned and managed by the Vindolanda Chartable Trust. It was built about 300 yards to the south of the Wall and measured about 440 by 420 feet and covering approximately 4 acres. There are no visible remains. 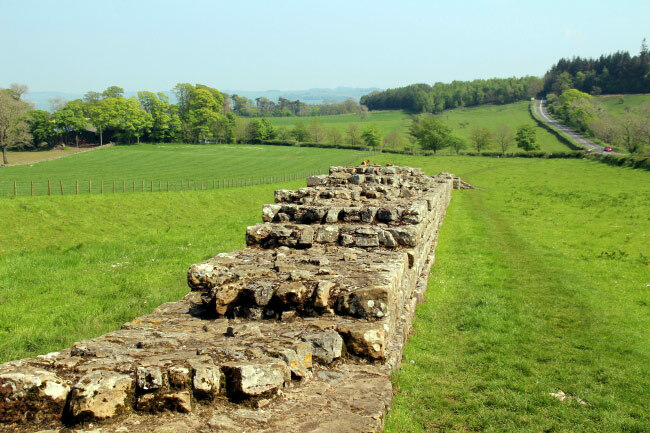 Camboglanna was the twelfth fort on Hadrian's Wall, almost 7 miles west of Birdoswald, overlooking the Cambeck Valley. It guarded an important approach to the Wall as well as the east bank of the Cambeck. The site was drastically levelled in 1791 when the gardens of Castlesteads House were laid over it. The fort was square, measuring about 400 by 400 feet and covering approximately 3.75 acres, was built about 300 yards to the south of the Wall. There are no visible remains. 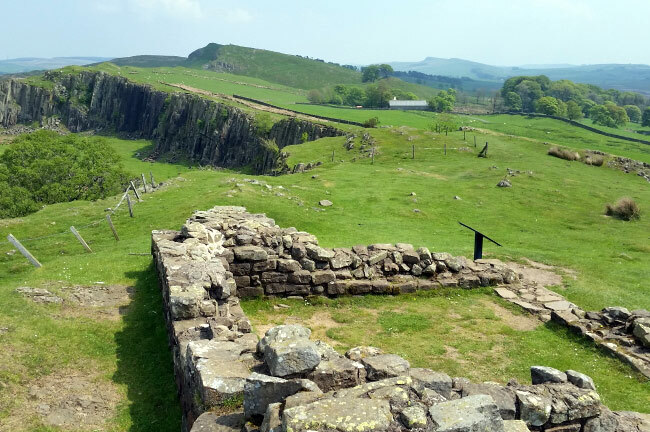 Uxelodunum was the largest fort on Hadrian's Wall. It is about five and a half miles east of Burgh by Sands, above the River Eden. The fort measures about 580 feet north to south by 700 feet east to west, covering approximately 9.32 acres and is adjacent to the Wall, which passes along its north side. 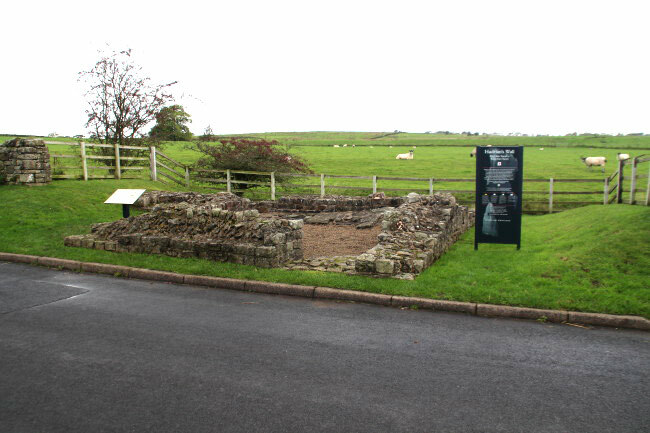 The fort has now been built over in the Carlisle suburb of Stanwix. Aballava fort is five and a half miles west of Stanwix. The fort was an oblong, straddling the Wall, and measured 500 feet north to south by 400 feeteast to west, occupying an area of 5 acres. It has now been built over. 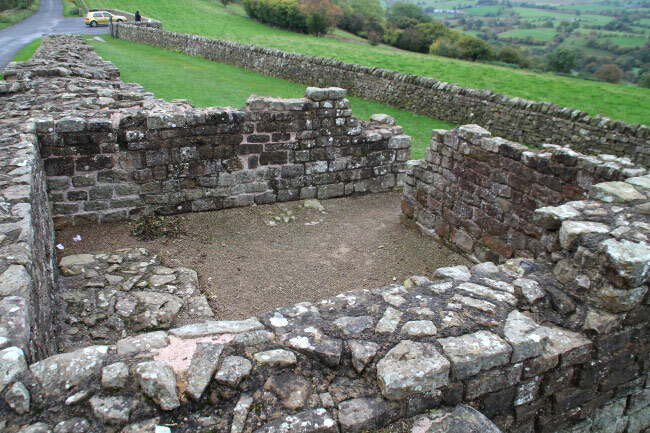 Concavata or Coggabata was built on a hill commanding views over the flatter land to the east and west and to the shore of the Solway Firth to the north. 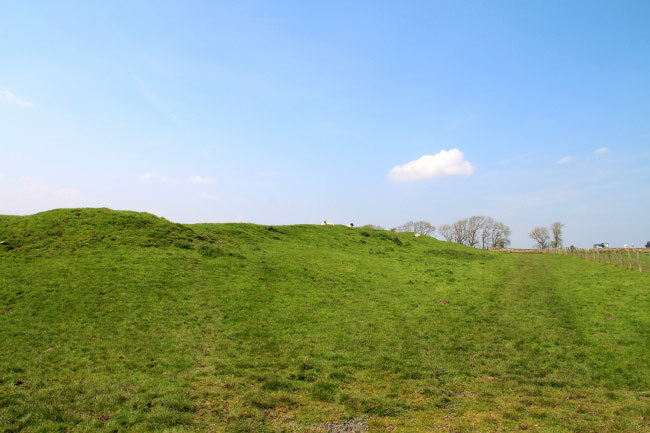 Its purpose was to guard the southern end of two important Solway fords, the Stonewath and the Sandwath. The fort was an oblong and built of stone, with the Wall running along its northern side, and measured 270 feet north to south by 316 feet east to west, occupying an area of just less than 2 acres. 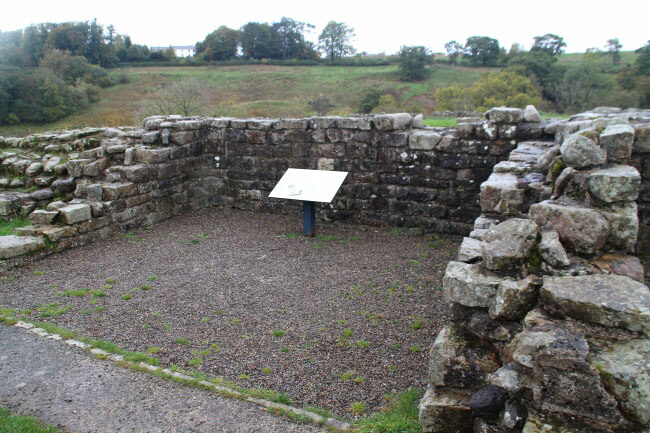 A manor house, Drumburgh Castle, was built over the fort using Roman stone. Maia, or Mais, was the last fort at the western end of the Wall. 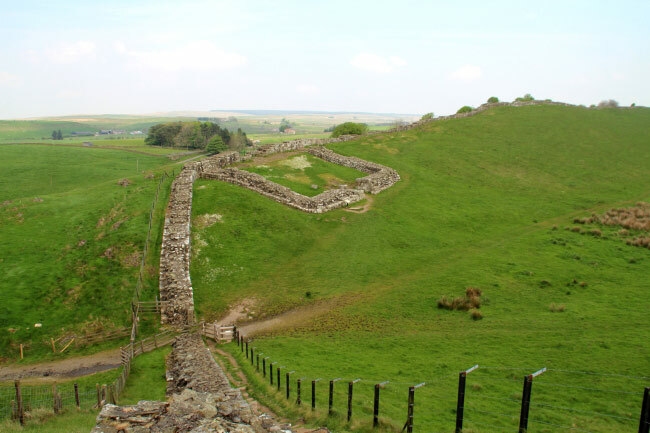 It stands on a sea-cliff over 50 feet high, and it was built over the site of the eightieth milecastle. 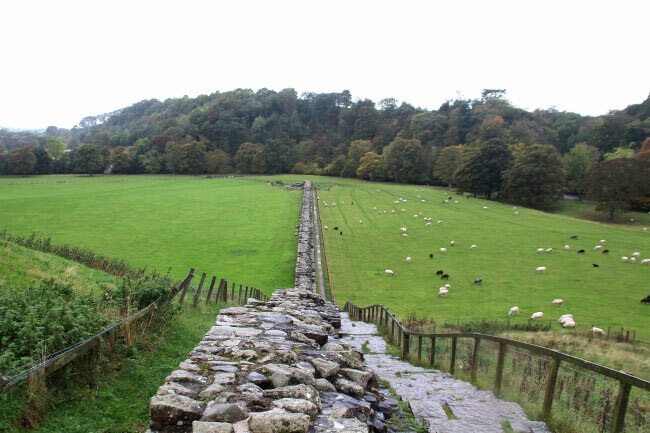 It was originally built with a turf and clay rampart, similar to the Turf Wall in that area, but when the Wall was rebuilt in stone, the fort was also rebuilt in stone. The fort is believed to have measured 710 feet by 420 feet, covering about 7 acres, making it the second largest on the Wall, after Stanwix. Over the years the cliff face has been eroded, and the north wall of the fort has collapsed into the sea. There are no visible remains. 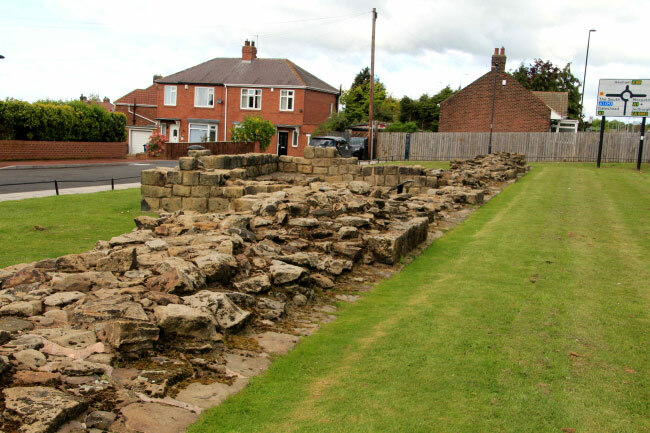 The foundations of Denton Hall Turret and a 65-metre length of Hadrian's Wall lie beside the A69 near the junction with the A1, between Benwell and Rudchester Forts. Turret Road, Newcastle-upon-Tyne, NE15 7TH. 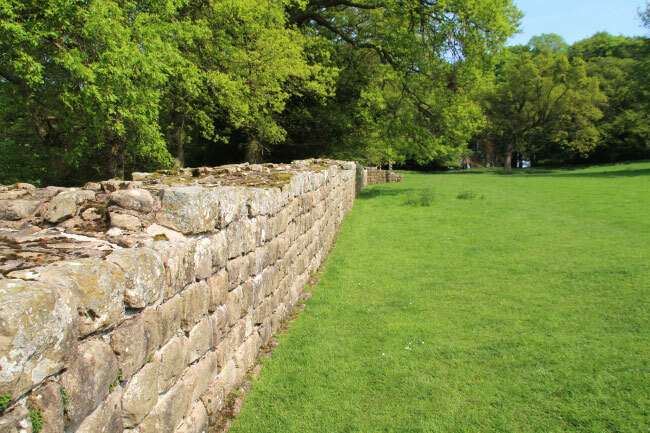 There is a consolidated stretch of Wall, up to two metres thick in places, that was probably completed in AD 122. Between Benwell and Rudchester Forts. 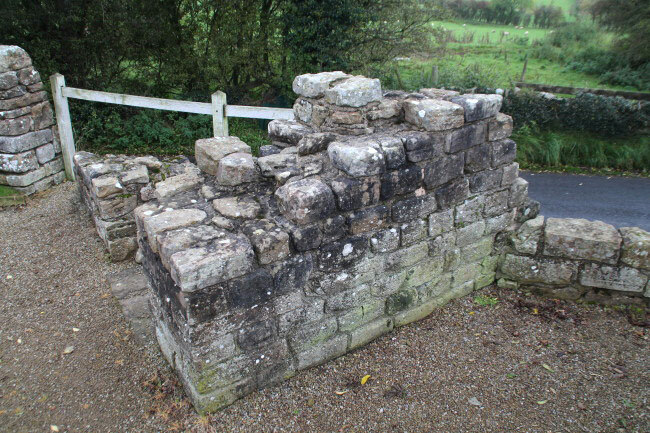 This section of wall and a surviving piece of turret 8 feet high is just across the river to the east of Chesters Fort. Chollerford, Hexham, Northumberland NE46 4EJ. 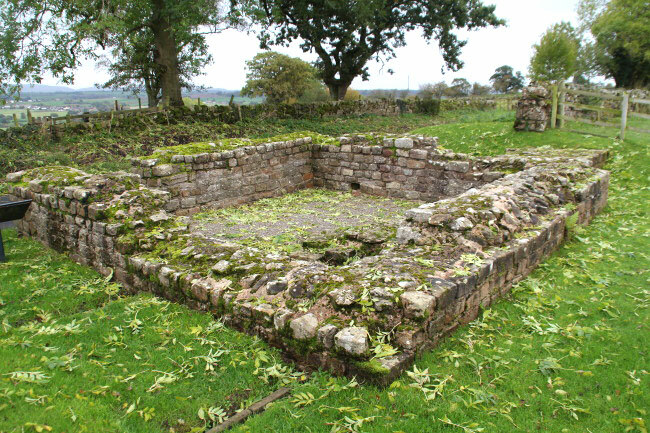 This turret sits within a 1500 feet length of Hadrian's Wall to the west of Chesters Fort. Cawfields is a mile and a half north of Haltwistle and six miles from Housesteads Roman Fort. 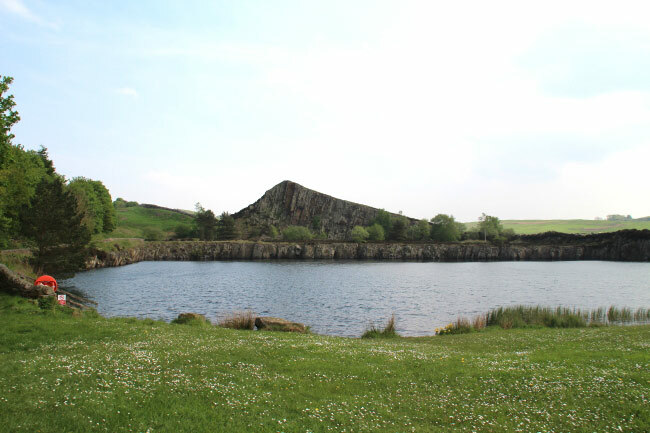 Walltown Crags is a mile north east of Greenhead, off the B6318. 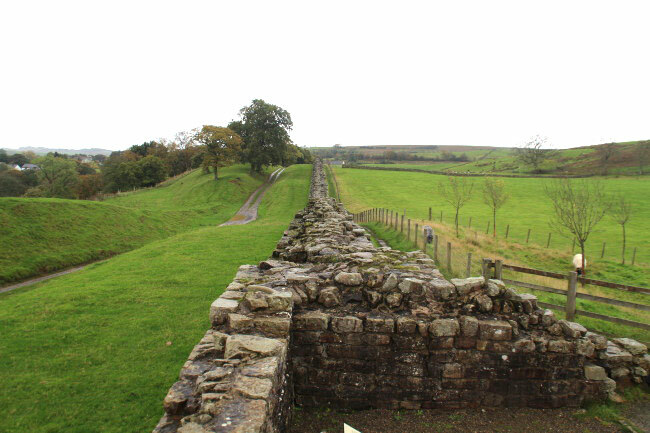 It is a very impressive section of Hadrian's Wall with panoramic views and Turret 45A is on top of the hill. 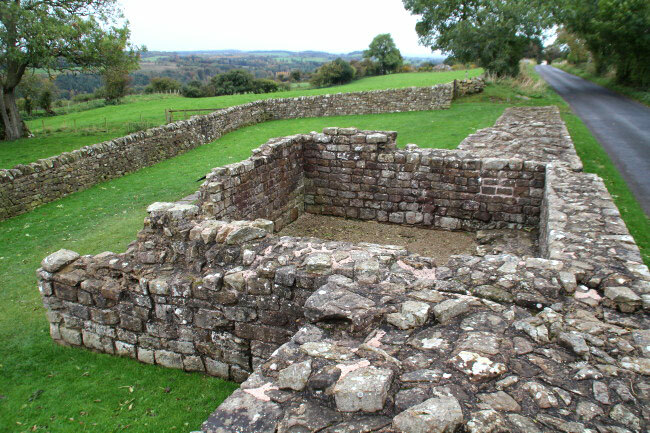 The Roman museum at Carvoran Fort is nearby. 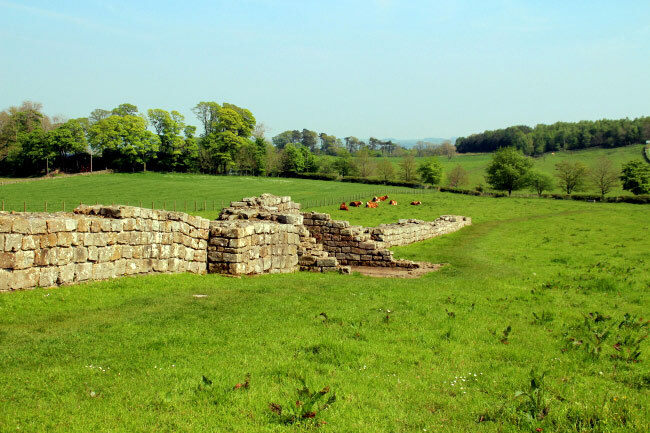 It is two miles away from Birdoswald Roman Fort, just outside the village of Gilsland and is managed by English Heritage. 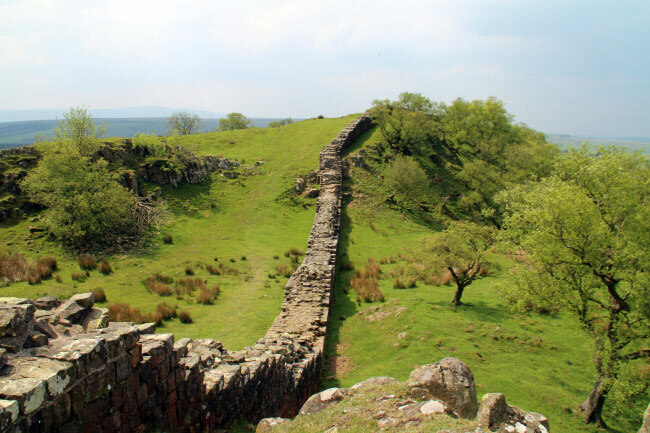 It is larger than many other milecastles, measuring 65 by 60 feet, and is one of the best-preserved on Hadrian's Wall. 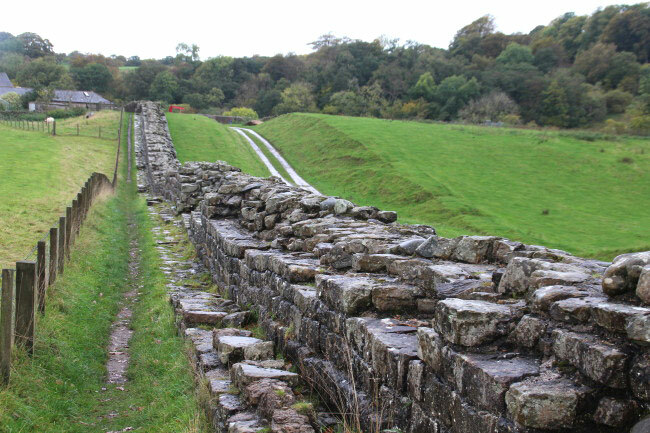 Part of the flight of stairs that once led on to the ramparts of Hadrian's Wall can be seen. 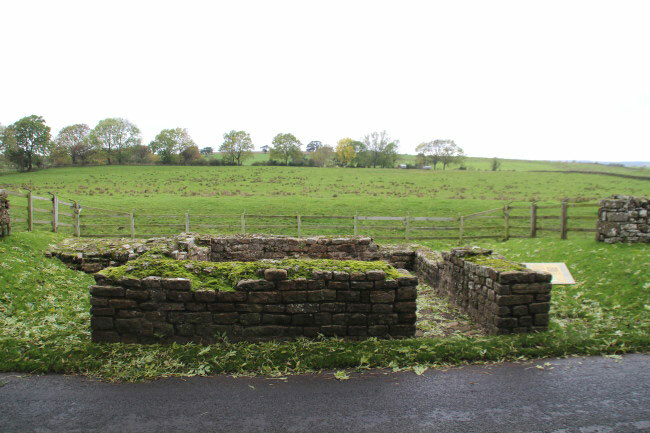 There are the remains of barracks which indicate the fort was manned by 64 soldiers. Turret 48a is one of the best preserved turrets on the Wall. It measures 13 feet across and the north wall stands 6 feet high. 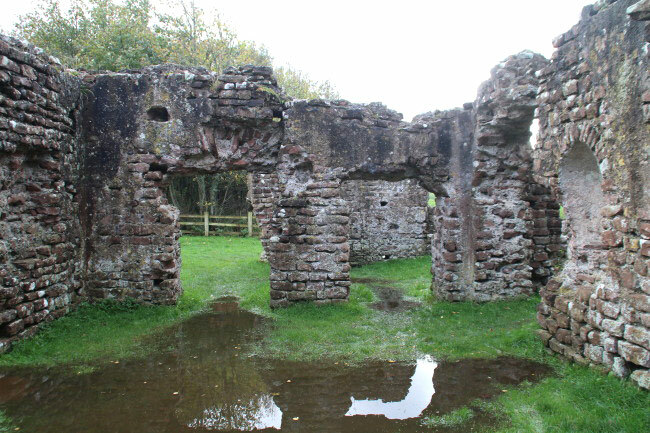 The doorway was in the south-west wall. 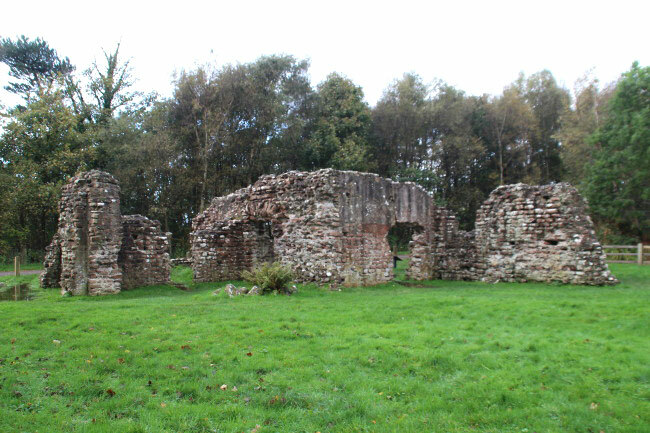 Turret 48b has been damaged more and now only stands nine courses high and is missing its south wall. Both turrets were recessed farther into the width of the Wall than theother turrets, which meant their front walls were comparatively thin. 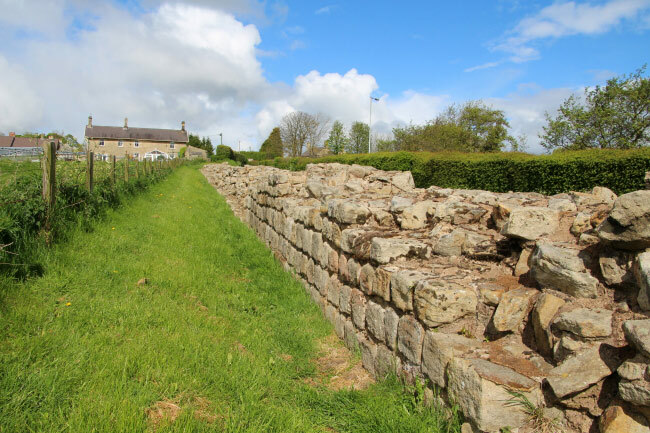 The three mile stretch of wall to the west of Birdoswald Roman Fort includes Leahill and Piper Sike turrets, which were built in stone in the early 2nd century AD. The wall in this sector was first built of turf, but was later replaced in stone, incorporating these turrets. 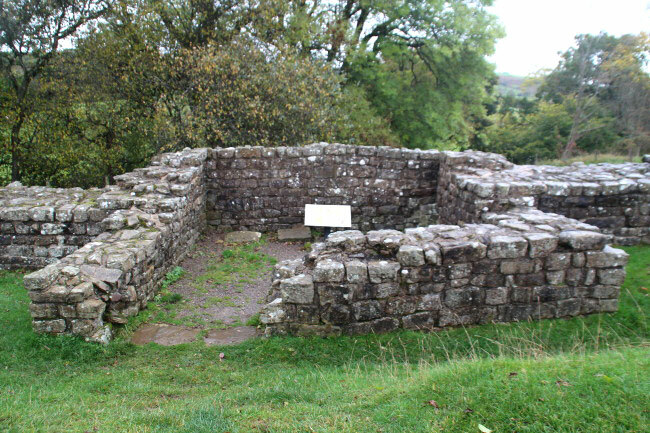 This was one of a number of signal stations that were built during the early 2nd century and was later incorporated into Hadrian's Wall. The tower is located between Turret 51B and Turret 52A with the fort of Banna located to the east. 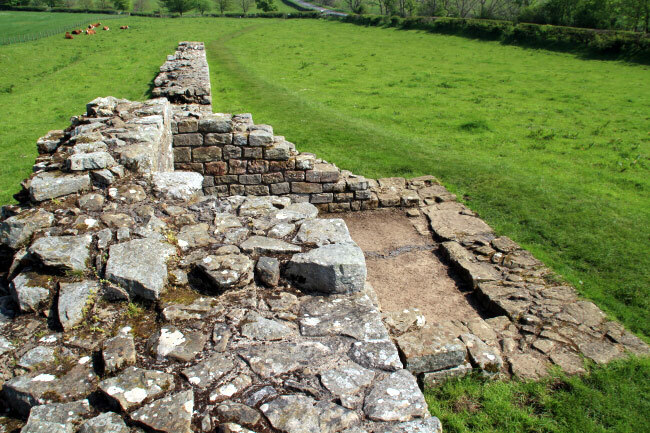 Banks East, between Birdoswald and Castlesteads Forts, is the best preserved turret in the western sector of Hadrian's Wall, where the Wall was originally made from turf.